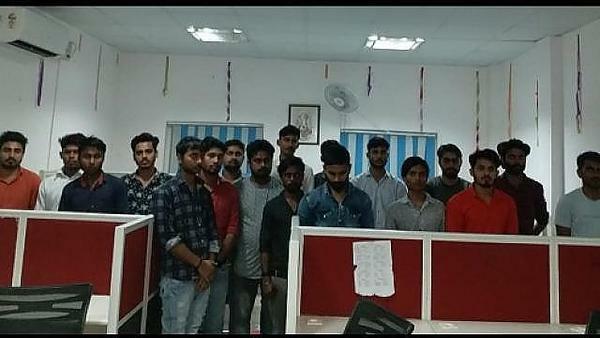 In the name of employing bank and government establishments, 18 people who have been duped by unemployed have been arrested by noida cyber cell on wednesday. Police have recovered fake documents, computers, mobile phones etc. from them. The arrested accused have admitted to cheating with hundreds of people during the interrogation. SP crime Ashok Kumar Singh said that on the basis of an information on wednesday, noida cyber cell has raided a company based in sector-6 and arrested 18 people from here. The names of the accused arrested include Roshan Kumar, Dheeraj Kumar, Aakash Tiwari, Fantus, Vikas Kumar, Ashutosh, Vikas Kumar, Monu Singh, Nigam Jain, Mukesh Kumar, Manish Kumar, Abhishek Singh, Rinku Kumar, Mohammad Shahzad, Satyam, Ahad, Abhishek and Bittu Pandey. SP Crime said that during the interrogation, the police have come to know that these people used to call the unemployed youth by stealing data from different employing sites and depositing money in their account by giving them the coveted job in banks and government establishments. Used to take. They told that the police has detected their 6 accounts. Police have recovered 5 computers, 36 mobile phones, fake documents and many important papers from them. The accused arrested during the interrogation told the police that they had been working to defraud the unemployed for a long time.